I hired a babysitter for an entire day last week and honestly, it was the best thing I’ve done in a long time. I know I’m not supposed to say things like this out loud, but I really needed a break from Vander. I love my son more than anything but he’s intensely needy. What, being 5 months old and all. BL was traveling for work and after playing a single mom for three days, I was about ready to pull my own hair out. To those of you who are in this role all of time, you are my heroes. As the daughter of a single mom you’d think I’d have more appreciation for the energy, patience and love it takes, but it didn’t really hit me until I didn’t have my own partner by my side. So, I took a break. I hired a babysitter and went to the gym. I went grocery shopping. I cleaned my house without having a baby strapped to me. I went to lunch by myself. It might have been a silly waste of money to have someone else do my job as a mom, but it was essential for my sanity. I know I’m a good mom but I can’t be a good mom if I have to be a mom all of the time. When I got back, I was in a much better place and so excited to see Vander again. We put on some music, I threw him in the sling and we made this yummy dinner together. 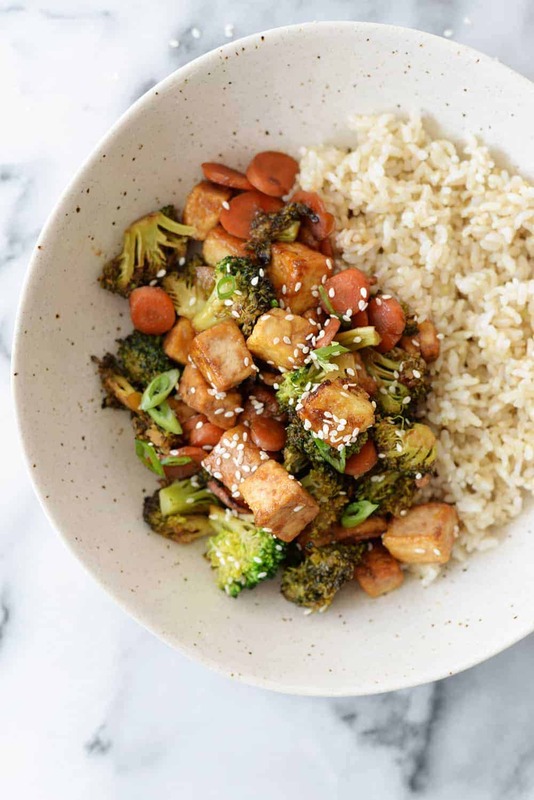 A simple stir-fry of tofu and veggies with brown rice. It was easy and nourishing, the perfect pairing after my reset-button day. I think you are going to love this weeknight meal as much as I did. 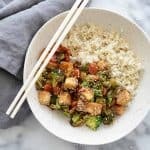 I know that many of you are looking for new tofu recipes and this stir-fry dinner is the perfect way to add more soy into your life. I’m a big tofu fan; there is so much confusion out there surrounding this food and most of it is unwarranted. 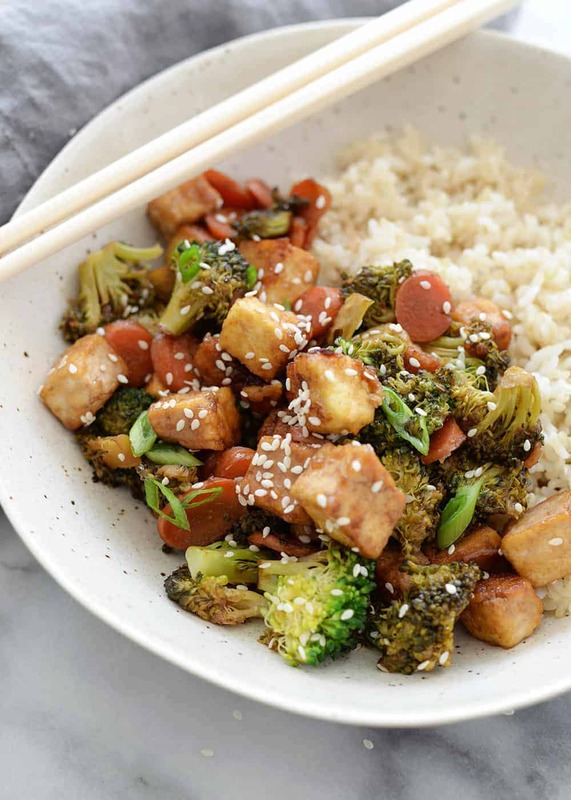 (PS- I wrote this recent article for Women’s Health on the health benefits of soyfoods) While I don’t eat soy everyday, I try and eat tofu at least 3-4 times a week and this stir-fry is a simple way to get in this nutrient-rich food. 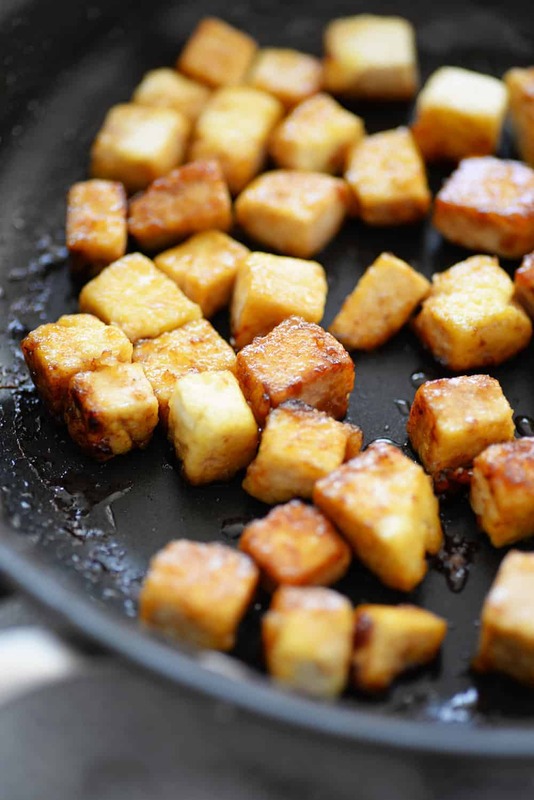 Here’s the trick for crispy pan-fried tofu: use a little cornstarch. Yup, if you want restaurant quality tofu without a ton of oil, you need a little cornstarch. Or, arrowroot starch for those of you who can’t have corn. Toss the pressed and cubed tofu with cornstarch, then pan fry in a smidge of oil. The cornstarch creates a crispy crust that allows the tofu to hold its shape after you add the sauce. Broccoli and carrots are my favorite stir-fry vegetables, but anything will work. That’s the other beauty of this dinner, it’s completely customizable to what you have on hand. The sauce is slightly sweet and plenty garlicky which means it will taste great with whatever you pair it with. Serve with brown rice, white rice or your favorite grain. I’ve been loving the microwave packets of brown rice from Trader Joe’s; they are ready in just 3 minutes and taste great. Sesame Ginger Tofu and Veggie Stir-Fry! Looking for a healthy dinner option? This is it! 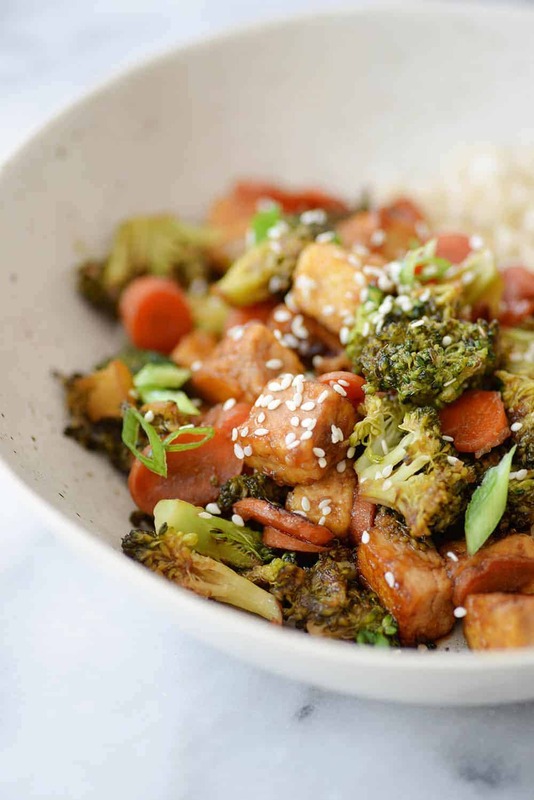 Perfectly crisp tofu, broccoli and carrots in a sesame-ginger-garlic sauce. Vegan & Gluten-Free. Press the tofu: you can use a tofu press or wrap the tofu in a kitchen towel or paper towels and place a heavy object on top. Let sit for 10 minutes while you prepare the sauce and chop the vegetables. Cube the tofu and toss with the salt and cornstarch until evenly coated. Whisk together the ingredients for the sauce and set aside: garlic, ginger, maple syrup, soy sauce, water, sesame oil, rice wine vinegar. Heat the oil in a large skillet over medium heat and add the tofu. Let fry for 2-3 minutes until crispy, then flip and cook another 2-3 minutes more until golden brown all over. Add 2 tablespoons of the sauce and let cook until tofu is caramelized. Remove the tofu and add another teaspoon or so of olive oil to the skillet. Add the broccoli and carrots and stir-fry until vegetables are tender, about 5-7 minutes. Add the sauce and the cooked tofu and cook 1-2 more additional minute until sauce is mostly absorbed. Great tip about the cornstarch!! I’ll have to try that next time! This was exactly what I was looking for—a quick, simple, satisfying supper. My tofu never crisped up (maybe it was too crowded in the pan? ), but my family enjoyed this recipe anyway! Glad you liked it Emily! Two thoughts (that I’ll add to the recipe as well)- a nonstick or cast-iron pan works best for crispy tofu like this. I tried it last night using my stainless steel pan and it didn’t get golden brown like it does when I use my cast-iron. Also, let the tofu crisp until the water seeps out; pulling it before it’s released from the pan will remove the crispy outside. Let me know how it works out with your cast iron! Hi Donna, I’m not sure as I haven’t tried this with pancake syrup before… it should have a similar flavor, but I’d cut back on the amount as sugar-free sweeteners tend to be more sweet. Start with a little, then add more if needed. I used honey in place of the syrup and it was delish (and probably more nutrish)! how does the nutritional values change if you don’t do the rice? Hi Nicole, a 1/2 cup serving of rice is 121 calories. A new favorite stir fry recipe!! Love the ginger and the subtle sweetness…great way to get the kids and husband to eat tofu too! Thanks Alex! Love this recipe! The stir fry sauce is really delicious and made my first attempt at serving tofu a success! You CAN teach an old dog new tricks!